TFM is an independent publication by theater fans for theater fans. Your support will keep us online. Click here to donate. As previously announced, “Beautiful: The Carole King Musical” is Atlantis Theatrical’s next musical. Featuring classics such as “You’ve Got a Friend,” “One Fine Day,” “So Far Away,” “Take Good Care of My Baby,” “Up on the Roof,” “You’ve Lost That Lovin’ Feeling,” “Will You Love Me Tomorrow,” and “Natural Woman, with a book by Douglas McGrath, ‘Beautiful’ is a jukebox musical about King’s true story– from teenage songwriter to Rock & Roll Hall of Fame inductee. Joining her is Nick Varricchio (A Chorus Line, Happy Days, The Light in the Piazza, Spring Awakening), who will be playing her husband and writing partner, Gerry Goffin. Varricchio was last seen in Manila as Double J in Atlantis’ touring production of “Saturday Night Fever”. This will be his second musical in Manila. Together, King and Goffin wrote over 20 hit songs, including “Up on the Roof” and “Will You Still Love Me Tomorrow.” They were married for nine years, from 1959 to 1968 and have two daughters, Louise and Sherry. “Beautiful” continues to run on Broadway, with a US National Tour. Jessie Mueller won the Tony Award for Best Leading Actress in a Musical when she originated the role in 2014. The musical is the second show in Atlantis’ 20th Anniversary Season. It is preceded by “Angels in America: Millennium Approaches”, which opens in March at the Carlos P. Romulo Auditorium of the RCBC Plaza. 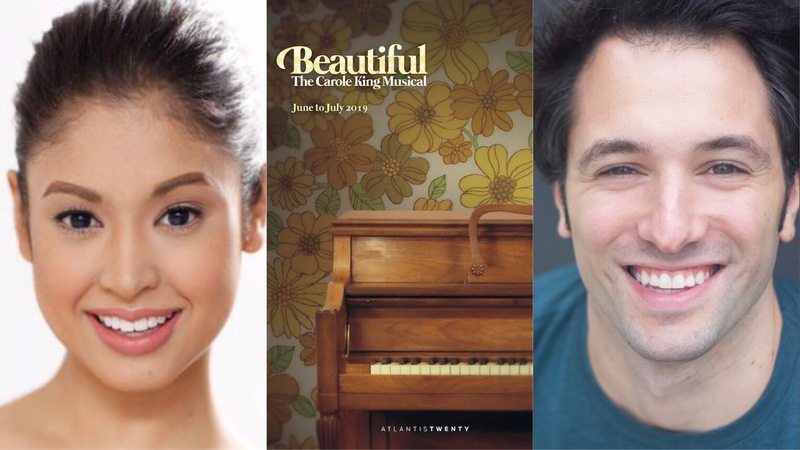 “Beautiful” opens on June 14 at the Meralco Theater. It will be directed by Bobby Garcia. Follow us on Facebook, Twitter, and Instagram for live coverage on theater events around the city. Subscribe to our YouTube channel for your first look at the hottest shows in town. Copyright ©2017 Theater Fans Manila, All Rights Reserved.